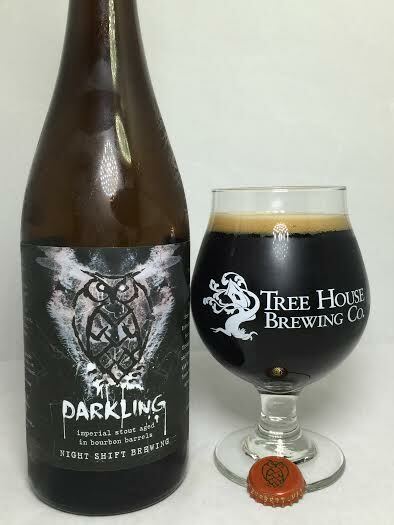 I believe this the 2nd release of Darkling and the first time I have had the chance to try it. Not much word on the aging process, but it is an Imperial Stout aged in Bourbon Barrels. The latest release was held this past Wednesday, but I was able to snag a few bottles a day later. No big deal. Damn that is decadent. Huge aromas of bourbon, oak, bitter dark chocolate, and dark fruits.There's also some dessert-like vanilla and caramel at the end of the line. Pretty stellar stuff. The taste...I mean...just...wow. Ludicrous amounts of bourbon right out of the gate with so much oak and barrel character it will make your head spin. The bourbon is velvety smooth and just sweet enough without being cloying. Bitter dark chocolate envelopes every taste bud along with cherries which makes for a cherry cordial flavor. Sugary caramel and coffee beans with a dusting of cocoa powder are also prominent, but vanilla isn't as nearly big as it was on the aroma, but an abundance of quad-like dark fruits are more than making up for it. The body and feel on this beer are unlike anything I have ever had in an Imperial Stout. In all of my past reviews of stouts I have commented on thick, viscous mouthfeels. Darkling has practically reinvented what an Imperial Stout should feel like. It's almost barium-like due to its absurd level of thickness, but not chalky or verging on solid in any way. Once it hits your tongue, it almost momentarily stops as if the beer hit a brick wall due to its thickness. I think Riley Reid is only person on Earth who has taken thicker and darker things in their mouth. As for the 10.0%, I can't find it as there is absolutely no burn and no warming. It's just smooth sailing all around. Darkling was a mind-blowing experience. Though this is my first time having it, I (in my own humble opinion) will safely call this a Bourbon County killer. Everything I love in a barrel-aged Imperial Stout is found in this bottle, but it has a mouthfeel 10x better than arguably any BA stout out there. This is not only up there with the likes of BCBS and Parabola, but I would choose this over those in a heart beat. Call me a "homer" all you want, but I dare you to try this and disagree with what I've said.